The word Hermitag e is also derived from the Russian word, meaning “place of rest.” Yet this hotel is more than a place to rest. The Hermitage Hotel is Nashville’s “place to be.” Sip a cocktail in the Oak Bar. 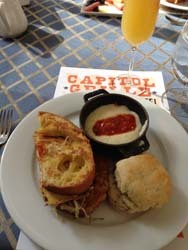 Dine at The Capitol Grille—on Southern fare created by executive chef and farmer, Tyler Brown— made of food products from the hotel’s own farm. Tour the famous men’s room, and sit in the shoeshine seats. Work out in the state of the art fitness center. Get married on the Veranda or the Grand Ball Room. Get a spa treatment, or take a bubble bath with a sip of Champagne soak in your own marble tub. And then lay down to rest in your luxury bed, appointed with the same type mattress as Queen Elizabeth has. And when you depart, new memories will follow—just as they are for me. This Pairings weekend is a miniature version of the annual l’Eté du Vin, kicking off at the Noah Liff Opera Center. Prior to arriving we take a short yet fun detour, when our driver mistakenly headed for the Grand Ole Opry of which he knows well, rather than the Noah Liff “Opera,” which he obviously does not. Upon our arrival Napa Valley’s Stags Leap District winemakers are pouring their wines, hors d’Oeuvres are being passed, and the silent auction is getting underway. Older vintages of these wines are later paired at dinner during the live auction—with cuisine from an outstanding line up of chefs. On Saturday we att end a delicious, private brunch prepared by chef Brown at the Veranda in The Hermitage Hotel. This spectacular space has white, arched marble and plaster domes—painted with blue skies—and two story windows. And during the evening we enjoy one of the private vintner dinners, held at Miel Restaurant. Here owner Seema Prasad and Chef Ashley Quick focus on fine dining using local organic produce from their proprietary garden located on the banks of the Cumberland River. An intimate dinner is shared with vintners of Robinson Family Vineyards and Ilsey Vineyards, as they paired their wines with Quick’s cuisine. The Nashville Wine Auction also has a rich history. 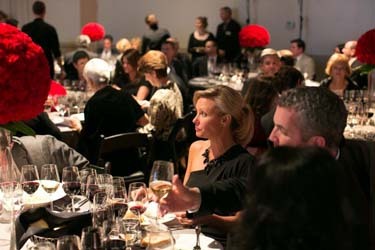 Since 1980 the Wine Auction has raised more than $17 million for organizations whose purpose is directly related to treatment, patient care and eradication of cancer in Middle Tennessee. The 34th Annual l’Eté du Vin will be held Saturday, July 20. The 2013 auction theme is Pour de France, highlighting the wine regions of France: Champagne Bordeaux, Burgundy, and Côtes du Rhône. The line up of events begins with a cocktail party and auction catalog preview, Grand Cru Evening on Thursday, June 20. One month later four events are held in successive dates. A Year in Burgundy, on Wednesday, July 17 will be hosted by guest of honor, Martine Saunier with her documentary, A Year in Burgundy, at The Franklin Theater. At the Vintners’ Tasting on Thursday, July 18, special guests Martine Saunier and Pierre-Emmanuel Taittinger offer in-depth knowledge of their featured wines. Patrons’ Dinner on Friday, July 19 will be a pairing of wine and food, hosted at the Hermitage Hotel, with dinner prepared by James Beard Award Winner, Chef Sean Brock, of Husk, Charleston. And at the 34th Annual l’Eté du Vin on Saturday, July 20, guests will enjoy a superb selection of wines paired with dinner, live music, and dancing. Auction lots of wines, dinners, fine gifts, and travel will be offered in both the Live and Silent Auctions. Visit NashvilleWineAuction.com for tickets or more information. And visit TheHermitageHotel.com for hotel rates and reservations.